The Greek island of Kefalonia is the largest of the Ionian Islands and is located above the island of Zakynthos and west of the Peloponnese peninsula in western Greece. Around a third of the islands’ population reside in its capital Argostoli. Another third can be found at Lixouri, the second major settlement, with the rest of the population spread amongst the other regions of Kefalonia. 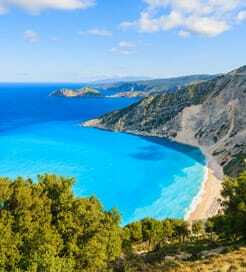 Though Kefalonia is now a popular tourist destination attracting visitors from all over the world, it was relatively unknown to the international tourist until more recently. Something perhaps influenced by the Hollywood adaptation of Louis de Bernières' novel - Captain Corelli's Mandolin - which was set on the island. Like most of the Greek islands, Kefalonia is well prepared for the influx of tourists during the holiday season and is relatively easy to get to by ferry too. For more information, please visit our Ferries from Greece to Kefalonia page. For more information, please visit our Ferries from Italy to Kefalonia page. For more information, please visit our Ferries from Ionian Islands to Kefalonia page.